The Federal Reserve’s Federal Open Market Committee (FOMC) adjourns from a scheduled two-day meeting Wednesday afternoon. The meeting’s outcome will influence the mortgage bond market, which, in turn, will change current mortgage rates for consumers nationwide. If you’re shopping for a home, then, or about to start a refinance, consider yourself alerted. 30-year rates are hovering near four percent and 5-year ARMs are near the twos; and, rates for FHA mortgages and VA loans are even lower. Once the Fed adjourns, however, rates will look a lot different. The thing is, though, analysts don’t know whether rates will be higher or lower. If you’re nervous rates will rise, consider locking in today. The Federal Open Market Committee (FOMC) meets this week and your future mortgage rate is at stake. The FOMC is a rotating, 12-person sub-committee within the Federal Reserve, headed by Federal Reserve Chairwoman Janet Yellen. The FOMC meets eight times annually on a pre-determined schedule, and on an emergency basis, when needed, as was required between 2008-2011 when the U.S. economy was staving off depression; and in 2013 when the U.S. government failed to raise its debt limit. The FOMC’s most well known role worldwide is as keeper of the Fed Funds Rate. The Fed Funds Rate is the prescribed rate at which banks lend money to each other on an overnight basis. Since December 2008, the Fed Funds Rate has been in a target range near zero percent, which is the lowest it’s been in history. When the Fed Funds Rate is low, the Fed is attempting to promote economic growth. This is because the Fed Funds Rate is correlated to Prime Rate, which is the basis of most bank lending including many business loans and consumer credit cards. For the Federal Reserve, manipulating the Fed Funds Rate is one way to manage its dual-charter of fostering maximum employment and maintaining stable prices. The Fed’s zero-interest rate policy has helped to create jobs, more than 12 million since 2010, and, for now, price pressures within the economy remain low. Some would say, then that the Fed is managing its dual-charter ably. However, a low Fed Funds Rate creates wage pressure and promotes risk-taking, both of which can quickly lead to inflation (i.e. rising prices). Plus, wage pressure may be mounting with the unemployment rate reaching 5 percent nationwide. For this reason, the Federal Reserve ended its zero-interest rate policy last month, raising rates by 25 basis points (0.25%) for the first time in more than a decade. However, the Fed move did not lead to an increase in consumer mortgage rates. This is because U.S. mortgage rates aren’t set or established by the Federal Reserve or any of its members. Rather, mortgage rates are determined by the price of mortgage-backed securities (MBS), a security sold via Wall Street. The Federal Reserve can affect today’s current mortgage rates, but it cannot set them. It’s a common belief that the Federal Reserve “makes” consumer mortgage rates. It doesn’t. The Fed doesn’t make mortgage rates. Mortgage rates are made on Wall Street. The Federal Reserve has no direct connection to U.S. current mortgage rates whatsoever. Here’s proof: Over the last two decades, the Fed Funds Rate and the average 30-year fixed rate mortgage rate have differed by as much as 5.25%, and by as little as 0.50%. If the Fed Funds Rate were truly linked to U.S. mortgage rates, the difference between the two rates would be linear or logarithmic, not jagged. That said, the Fed does exert an influence on today’s mortgage rates. After its scheduled meetings, the FOMC issues a press release to the public, which highlights the group’s economic opinions and consensus. When the FOMC’s post-meeting press release is generally “positive” on the U.S. economy, mortgage rates tend to rise. Conversely, when the Fed is generally negative with its outlook, mortgage rates tend to fall. Lately, the Fed has shown a mix of positive and negative sentiment. The group has acknowledged that the U.S. economy is improving, but that growth obstacles remain. It has also said that inflation rates remain stubbornly low, which is a concern as well. The Federal Reserve’s official statement will be released at 2:00 PM ET Wednesday. Expect current mortgage rates to be volatile and difficult to lock. It may be prudent to shop for a mortgage before the Fed adjourns rather than after. The Fed does more than just set the Fed Funds Rate. It also gives economic guidance to markets. For rate shoppers, one of the key messages for which to listen is the one the Fed spreads on inflation. Inflation is the enemy of mortgage bonds and, in general, when inflation pressures are growing, mortgage rates are rising. The link between inflation rates and current mortgage rates is direct, as homeowners in the early-1980s experienced. High inflation rates at the time led to the highest mortgage rates ever. 30-year mortgage rates went for over 17 percent (as an entire generation of borrowers will remind you); and 15-year loans weren’t much better. Inflation is an economic term describing the loss of purchasing power. When inflation is present within an economy, more of the same currency is required to purchase the same number of goods. We experience inflation at the grocery store. A gallon of milk used to cost $2. Today, it costs $3. More money is required to purchase the same amount of milk because each dollar holds less value. Meanwhile, mortgage rates are based on the price of mortgage-backed securities (MBS) and mortgage-backed securities are U.S. dollar-denominated. This means that devaluation in the U.S. dollar will result in the devaluation of U.S. mortgage-backed securities as well. When inflation is present in the economy, then, the value of a mortgage bond drops, which leads to higher mortgage rates. This is why Wall Street closely watches the Fed’s comments on inflation. The more inflationary pressures the Fed fingers in the economy, the more likely it is that mortgage rates will rise. Inflation is currently well below the Fed’s 2% per year target. The Federal Reserve adjourns from its first scheduled meeting of the year Wednesday afternoon. 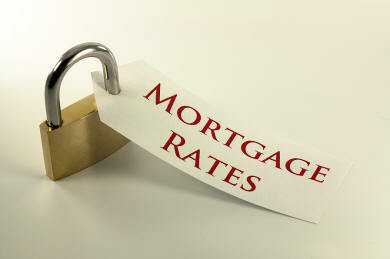 Current mortgage rate pricing may change within minutes.